So I had an exam today in which one of the questions was in what class (I-IV) of the Biopharmaceutical Classification System (BCS) the drug nifedipine falls in. Class I drugs are considered highly soluble and highly permeable, class II badly soluble and highly permeable, class III highly solube and badly permeable and class IV badly soluble and badly permeable. According to HHS-FDA a drug is considered a highly permeable, when more than 90% of the orally administered dose is absorbed in the small intestine. Obviously judging from literature it falls under BCS class II and you'd probably assume so if you look at the solubility (practically insoluble in water <1g/10000ml) and the permeability, which is good because it is absorbed well (>90%). However the way the question was asked was interesting because of the information given. It explicitly said that a dose of 20 mg was the maximum dose and no exact solubility was given except that the solubility was "practically insoluble", meaning a solubility of < 1 g/ 10000 ml. Now whether the solubility is 1g /10001 ml or 1g/ 100002 ml, nobody knows... The extent of absorption given was 90% and thus high permeability was assumed. However when you calculate how much volume of water is needed to let this fully dissolve, you'd come with the answer 0,02 * 10000 = 200 ml water. This is smaller than 250 ml and thus one would be inclined to then assume the solubility is high according to the specifications stated above, which would lead you to think the drug falls under BCS class I. Of course in reality you'd have to take into account the exact solubility which probably isn't exactly 1 g/10000 ml and the exact volume of the gastrointestinal tract which probably isnt exactly 250 ml. Now what am I supposed to believe in this situation? In this case the dose plays an important role in determining the BCS class and thus answering the question. Would you in this case have taken the rules for what they are and follow them like I did, taking into account dose and assuming the lowest solubility or would you have based it purely on the "practical insolubility in water" of the drug and conclude low solubility and thus BCS class II? Maybe I'm thinking too hard about this, but I'm curious if anyone has something to say on this. I personally think it would've been fair if the exact solubility (perhaps even a fictive solubility) of nifedipine and exact volume of GIT were given in this situation to make this question more clear. The tl;dr answer is that, as the question is worded (and without an actual copy of the question or the data provided to you), its not possible to definitively assign a BCS class. 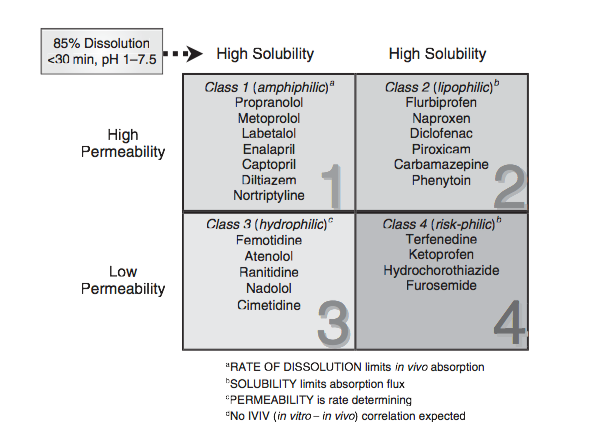 class II is low solubility and high permeability. Formulation typically is used to enhance solubility of compounds in this class. The data in your question is a little confusing, but you state that the compound is 'practically insoluble' which means that it must be either class II or class IV (practically insoluble definitely suggests low solubility). With the information provided (i.e. nothing about permeability), you cannot distinguish between II and IV. Permeability, whilst often correlated to solubility, is not directly linked, such that you cannot attempt (as I think you have tried) to calculate one based on the other (how permeable something is depends upon structure, and whether it can get through the membrane).